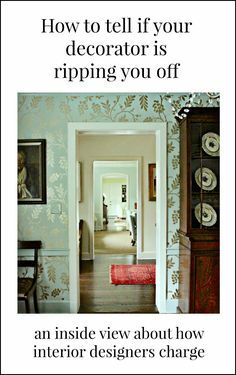 There have been a lot of interior decorating questions recently and I’m going to weave them into one post. Lighting options and what goes with what? What size lamp or chandelier? How many wall colors can you use in a home? Of course, each of these could be a separate blog post, but the idea is to give a more holistic response, because they are actually all interrelated. Jana is an interior designer who is probably best known for her brushstroke lamp (sold on her website which I would say already has icon designation. She also sells other ceramics, fabrics and art. And who knows what will be next! These are most of the colorways, but there are a few more. As an exercise, what I’ve done is taken a whole bunch of other lamps, ceiling fixtures, sconces and made a widget. What isn’t used for the living room could go in another room. In other words, the light fixtures that you will see eventually (after we take care of a little business), all go with each other! The code for the catalog sale (sitewide) is: OKL01CATALOG and I believe that it’s good until mid-February. There ARE a bunch of vendors that are excluded. Quel drag. But there are still a lot that aren’t excluded. But it is only for two days, which I assume means the rest of today and tomorrow. you can read the excluded vendors here. It’s a smaller list. And it’s for furniture only. Several of my faves are on the hot sales page and it is under the catalog promo code OKL01CATALOG which is site-wide (excluding many vendors). For furniture, you may use either promo code. Sorry, if it’s a little confusing. Furniture, you can use either promo code. Lighting only the catalog promo code. Okay, let’s get back to Jana and the recent interior decorating questions. I love Jana’s fresh, young traditional look. Notice how she balances out the room with lots of texture, black and other dark colors and white. This was a room that she did for the One Room Challenge™ about a year ago. Here are a few more images from Jana’s portfolio. 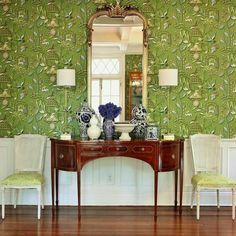 Wonderful faux bamboo Chinese Chippendale side chairs. They look like the ones from Jonathan Adler which she then reupholstered. I did that once too, which you can see here. What I love is these are basically neutral rooms, so that the accent colors could change if she liked. For instance, she has done that here. I’m not sure if this is before or after the other one. But no matter, you can see that with a neutral base, it is not terribly difficult to change the palette. But let’s go back to the more colorful version. The color is Farrow and Ball Cornforth White which is a close match to Benjamin Moore Barren Plain (sorry, I messed up the number on the chart. It should be 2111-60. 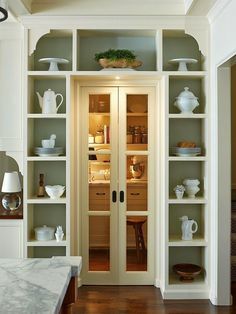 For those of you, who own the Laurel Home Paint and Palette Collection, you are at a huge advantage. For instance, we can find a color in the collection that is close to Cornforth white and from there, we can go to town. And then we can take a palette which has sea froth and classic gray which are similar to Cornforth white and from there build a palette. Which I’ve already done for you. Below are two palettes which come with beautiful room boards from the paint palette collection. There are a total of 40 palettes plus 12 bonus palettes. They all come with a board. Actually, this one is from one of the bonus boards. There are 12 of those. Okay, 11. One of them is just a board but it is a special board. Let’s say that the hallway, is a soft white like Cloud white or white blush. Then, for another room nearby we could do racing orange red, deep royal, one of the pinks, a green, or a deeper neutral like Chelsea gray. It is very difficult to ascertain how many wall colors one can have. But usually, I would not do more than 3 or four that are visible to each other. And then maybe another room will have wallpaper. I am not including bathrooms and laundry rooms. Things like that. And this is only for the main living areas of a home with actual rooms. Of course, you could paint everything white and then vary the accent colors, carrying a thread of one of them. I think that there should always be a thread of some color to carry through all of the rooms. If a lot of unusual colors are used, then they all need to live in at least one of the rooms. Ben Pentreath is an excellent example of this because all of his colors live in the uhhhhh living room. As for table lamps, there is a recent school that says the bigger the better. Tell me, if you have an end table that is 27″ high, how is a 36″ lamp supposed to look good on it? (unless it’s in a barn of a room) The only exception I can think of is if it’s a true mid-century vintage look, where the end tables are quite low and the lamps are quite big. But it’s an affectation of that era. For most living rooms a table lamp of from 26″-31″ is the optimal size IMO. I’m going to be going through more rules of thumb soon. And the reason is that I keep seeing stuff that’s wrong. For instance that an end table should be two inches lower than the sofa arm. That just doesn’t happen if you have an English roll arm sofa with an arm at 23″! In defense of the designer who said that, she might not have actually said that. Happens all of the time. But before I forget, here are all of the beautiful light fixtures on sale! You can pick out one table lamp, one sconce, one ceiling lamp plus a brushstroke lamp. Of course, there are millions of combinations that would work. Of course, some of these would go in a more casual room like the Vendome. It is dressier in the brass, but handsome in the bronze finish shown. And a few are for dining rooms. One or two are for kids rooms, but they could also be used as accent lamps just about anywhere. If you like this, I could do it for a different type of home, one day. And finally. All of Serena and Lily’s gorgeous rugs are on sale right now too, (through Feb. 5th) including all of the new ones. Can I tell you how much I adore this new Abaca rug? Speaking of S & L, I can hardly contain myself. Someone emailed me from there yesterday. Out of the blue!!! Laurel is suddenly having an out-of-body experience, floating high above herself which just fell to the floor. Surely, it’s a fake. I really need a bigger place. I’ll keep you posted about that one! PS: Please don’t forget to check out the Hot Sales Pages. Some really beautiful things this week! 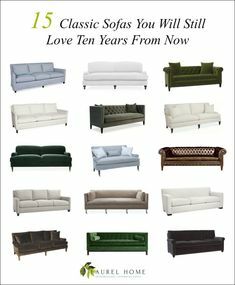 The Best Upholstery Fabrics And Some You Should Never Use! I have been following your delightful blog for nearly 2 years and I just LOVE the information you pass on. I’m having an outer body experience for you!!! I hope you share your choices, etc…. That news made my day, I’m so excited for you!!! Oh yes, I will definitely share all! And the other good news is that S&L is opening a store in Summit, NJ. Oh that’s fabulous about the S&L store in Summit. I’ve actually been there a couple of times as I had a job there about 20 years ago! Beautiful area. As for the husband and the LED bulbs… this is what I would say. ARE YOU FREAKING KIDDING ME??????? I’m a little confused because it sounds like the diameter of the console table, but a console table is rectangular. If the table is against the wall and you’re worried about the lamp shade fitting in the allotted space, I find that it’s okay to go a couple inches wider in diameter than the width of the table, but probably not more than that. I was in their LA store last year and I wanted everything in there! On top of it, they threw THE classiest cocktail party I’ve ever been too. Unfortunately, I couldn’t eat much because was going out to dinner with friends, but the point is they went to a lot of trouble and expense to make it nice for us design bloggers from the design blogger’s conference. I love this post and Jana’s fresh and feminine rooms. Are those faux Roman shades on the smaller window in her living room? But I also love a big lamp – I just do. It’s sculpture. my pet peeve is small lamps and small pillows – they just look cheap to me. Even the smaller Spitzmillers look like a compromise. Their glory is in going big imho (and a fortuned I KNOW). Unless intentional – like the tiny thomas o’brain terri lamp – it’s chic as hell. I bought one, but now I want to stash one in every room – it’s so beeeautiful. So i will continue to love my big 50s murano lamps (34″) – my LR room is 30 feet x 27 w/ 11 foot ceilings. Small things get lost in here. I’m sorry, but I think that you misunderstood my statement or maybe it was just fast reading. Your room sounds awesome and belongs in one of the exception categories stated (if not both of them) “unless you have a big barn of a room,” meaning big with high ceilings is one exception. But most of us don’t have such large rooms and I have seen spaces where a 35″ lamp looks cartoonish. So, it all depends on the size of the room, the ceiling height and the size/styling of the rest of the furnishings. One question I have found unanswered anywhere is matching DXV sinks in Canvas White. It is by far the most different white from other brands! Well, if I was doing consultations and I had a DXV sink sitting here in Canvas White, I’d be happy to match up a beautiful white with it. But when it comes to matching white paint with white appliances and/or sinks, I prefer to use the word coordinate. There will never be a perfect match anyway. And the eye will try to match the colors because that’s what our eyes do. There are different materials, vertical, vs horizontal and then there are the other elements as well, counters, tile, floor. I think it helps to hold them all up together as they will be living in the room and try to replicate the lighting as best as one can.